Landscape lighting installation is a valuable tool for every homeowner. Not only does outdoor lighting showcase some of your home's most attractive features, but it provides essential illumination for late-night guests as well. Your loved ones and visitors will appreciate the extra light your new fixtures provide as they navigate your property after sundown. As the weather warms and we turn out of our homes to enjoy the summer, landscape lighting installation options become something a homeowner may consider. Installing landscape lighting means we can spend even more time outdoors in summer enjoying backyard barbecues and swimming pools. Pleasant thoughts of these activities bring our outdoor lighting to the forefront of our minds. Judiciously placed lighting can showcase the most attractive features of a landscape. Who doesn’t love lights which show off the beautiful architectural features of a home, or a single beam which makes the arms of a paloverde tree stark against the backdrop of a wall? 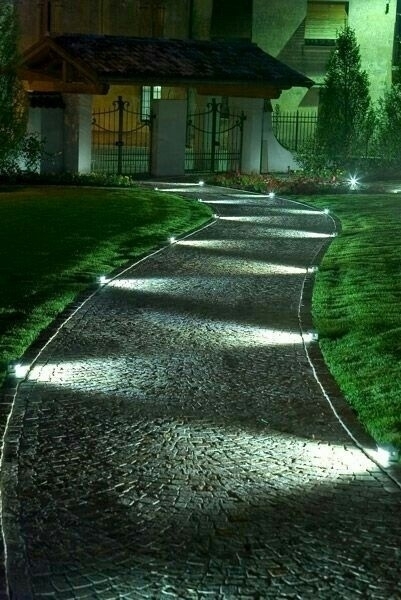 There is something so satisfying about an illuminated path. “This way,” it seems to say. The fact that we won’t trip because we’ll be able to see is a big plus, too. Strips or ropes of lighting used to highlight steps, bricks, or paths is a relative newcomer to the scene, but we don’t think this one is going to be dying out soon. LED lighting is high-quality lighting and economical to operate. These are partially or wholly buried, for a clean landscape look which readily offers low-level light along walls and building edgeways. Low voltage landscape lighting can either shine downward or be used at ground level, for example, against a wall or other feature that needs illumination without a prison-yard-like glare. One of the hottest new looks in lighting is strands of globe lights, such as those which cross 83rd Avenue over Peoria’s ‘P83’, the ‘pedestrian-friendly regional destination’ that is home to the Peoria baseball field, for one thing. The festive decor is one that can be copied in the backyard with a few strands of globe lights. Homeowners who may enjoy a lighting upgrade or are considering remodeling their outdoor lighting can give us a call or schedule a consultation here.